When our friends Graham and Cristen visited last month they came with all kinds of South Georgia goodies – a bag of Vidalia onions, local honey and tons of fresh mint from their garden. 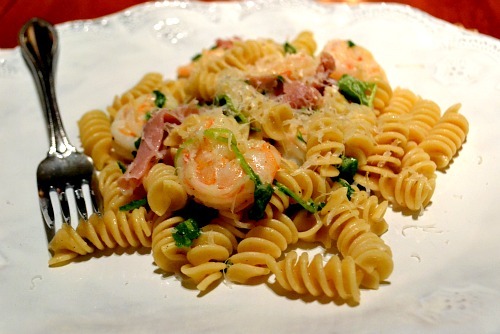 I was eager to find a recipe that used lots of fresh mint and after looking around for a while I settled on Jumbo Shrimp with Mint and Basil Pesto from Giada De Laurentiis. I have to be honest here…it’s been fun to search for recipes from sources other than Gourmet although Epicurious is still my number one choice for online recipes. I’m actually not a huge fan of the Food Network (and I hate their website – not user friendly…I digress) but I do usually like most of Giada’s recipes and this one was great. You can easily have this dinner on the table in under 20 minutes – especially if you follow my lead and serve it with cous cous. The pesto is very flavorful and the mint and basil complement each other nicely. I did not have time to make it to the bulk bins to purchase pine nuts and was not about to pay $10 for a small amount of them at my normal grocery so I substituted toasted walnuts. The recipe calls for pan sautéing the shrimp but I also think they would be great on the grill. We loved this simple dinner and I enjoyed the leftovers served atop a bed of lettuce for lunch the next day. I made up the cous cous as I went. I sautéed diced onion and minced garlic in olive oil in a small saucepan and then added in whole wheat cous cous, water and salt. Once the cous cous had absorbed the liquid, I stirred in feta, diced tomatoes and chopped fresh basil and mint. A great summery dish using the herbs in your garden! One Year Ago: Oatmeal Raisin Cookies – my go-to oatmeal raisin cookie recipe. So good! Combine mint, basil, pine nuts and garlic in a food processor until finely chopped. With the machine running, gradually add 1/4 cup of olive oil, until well blended. Transfer pesto to a medium bowl and stir in the Parmesan. Season with salt and pepper, to taste. 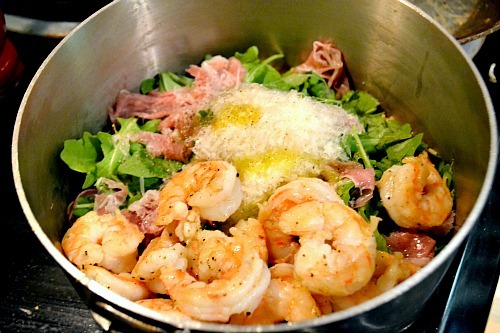 Toss shrimp with the extra-virgin olive oil in a large bowl to coat. Sprinkle with salt and pepper and toss again. Heat a heavy large skillet over medium-high heat. Working in two batches, add the shrimp and sauté until just cooked through, about 3 minutes, careful not to overcook. Toss shrimp pesto to coat. I love barbecue shrimp but I’m usually scared away from serving it reguarly because of the amount of butter in the sauce. And you know you have to eat all the sauce – the best part is dipping your bread in it! My dad used to always order this dish when we were on vacation at the beach. He worked for several years to perfect his at home version and that’s the recipe I’ve always used when I make this. And sorry to disappoint…but you’re not getting the full fat version today. You’re getting my first (and very successful) attempt at scaling it back some. While Brandon said it’s definitely not the same as the real version, it’s pretty darn good for a substitute. If you’ve never had barbecue shrimp make sure to serve it with good French bread for mopping the sauce. Also, leave the shells on the shrimp. I know it’s tempting to take them off. But trust me…part of the fun of this dish is getting a little messy! So I promise to give you my dad’s recipe in the future. But try this version and let me know what you think. It’s different but I think you’ll be pleasantly surprised…and walk away from the table with slightly less guilt! Combine the first 10 ingredients in a medium skillet over medium-high heat. Bring mixture to a boil. Add in shrimp and chicken broth and cook for 3-5 minutes, until shrimp turn pink (depending on size of your shrimp). Season with salt and pepper to taste. Serve with lemon wedges and French bread. I look for any excuse to cook for a special occasion – especially fun things like Fat Tuesday, St. Patricks, Cinco de Mayo, even the opening ceremonies of the Olympics (we had friends over for a Chinese feast!). While menu planning this week, I knew Fat Tuesday had to be Cajun themed. On to dinner. I’d been craving jambalaya for the last few weeks so there was no hemming and hawing over what to make (which is abnormal for me – usually I pour over recipes for hours). I’ve tried several recipes over the last few years and have recently found my favorite – it’s Emeril’s Cajun Jambalaya. 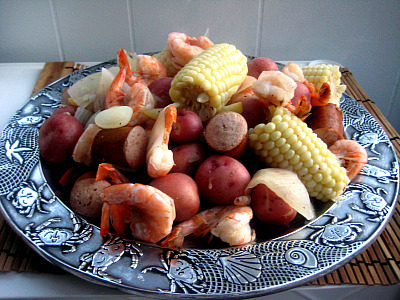 I love all the veggies along with the trio of shrimp, andouille and chicken – it also has a great flavor and a good amount of heat. Surprisingly enough, this comes together relatively quickly, especially if you buy deveined shrimp. I definitely recommend this next time you are in the mood for a cajun dish! 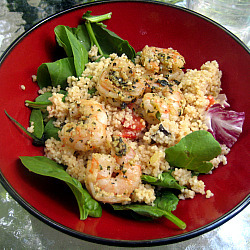 In a bowl, combine shrimp, chicken and Creole seasoning. If you’re using pre-cooked chicken do not add the chicken in with the shrimp. Work in seasoning well. Heat oil in a large saucepan over medium-high heat. Stir in onion, celery and bell pepper and cook about three minutes. Add garlic, tomatotes, bay leaves, worcestershire, hot sauce and cayenne. Stir in rice and slowly add broth. Reduce heat to medium and cook until rice absorbs liquid and becomes tender, stirring occasionaly, about 15 minutes. 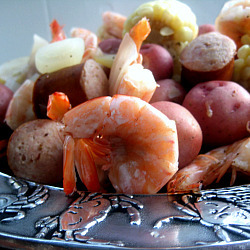 Then add shrimp, chicken and sausage. Cook until meat is done, about 10 more minutes. Season to taste with salt, pepper and creole seasoning.